Olympus’ VS120 virtual slide systems have been updated to enable precision and accuracy in high-speed fluorescence and brightfield scanning – with the ability to scan a brightfield slide in under two minutes. The product range also delivers accurate scanning in phase contrast, darkfield, polarisation and multichannel fluorescence – providing a fully automated and flexible approach to digitising and sharing images and data across research, clinical and educational applications, regardless of illumination technique. The new VS120-S6 Slide Scanner can scan up to six slides automatically with its completely re-designed scanning stage supporting rapid high accuracy scanning and precise stitching for a range of objectives including 60x and 100x oil immersion or 30x, 60x silicon objectives. For high-throughput applications, the VS120-L100 Slide Loader System provides reliable ‘walk-away’ scanning of up to 100 slides. Both systems can be upgraded for multichannel fluorescence acquisition via an additional extension module. The implementation of the highly sensitive Hamamatsu Orca Flash 4.0 sCMOS fluorescence camera provides effective fluorescence detection thanks to an enhanced signal to noise ratio and a large field of view. These features increase imaging speed up to 3x compared to conventional fluorescence cameras, minimising bleaching effects. In combination with high resolution objectives, support for this camera presents an optimum solution for high quality, fast fluorescence scanning. The rapid and reliable whole slide scanning provided by the VS120 enables creation of exact digital copies of original slides. With a pixel resolution down to 0.11 µm/pixel (60x oil immersion objective), the exceptional image quality ensures excellent results in visual analysis and diagnoses. 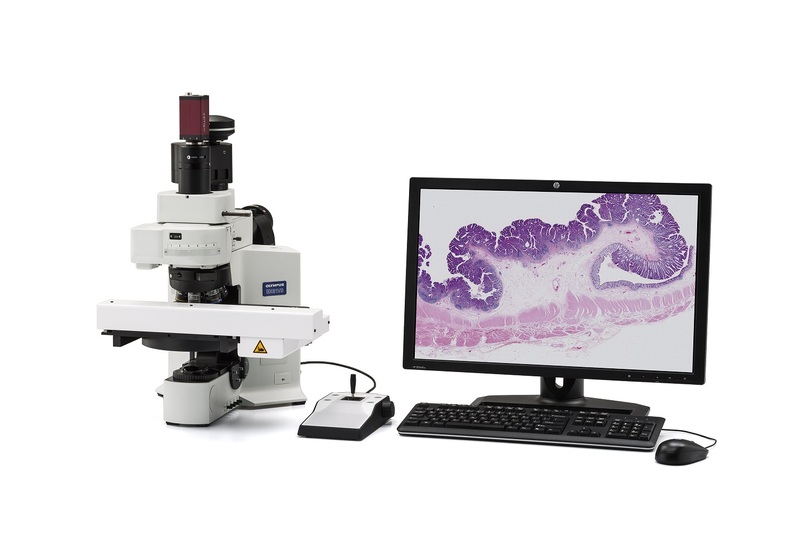 By generating a precise copy of the entire specimen at high resolution, users can view and analyse samples regardless of their proximity to the microscope – an ideal solution for a wide range of applications such as research, remote consulting, archiving sensitive fluorescence slides or teaching and conferencing. Furthermore, all images are stored on a central server, making simultaneous, world-wide evaluation possible. The latest update also includes a transmission overlay to automatically combine monochrome brightfield and fluorescence images, faster meander scanning, precise image stitching at high resolution, fluorescence shading correction and an online deblur function for clear image acquisition on thick samples. Combined with support for multiple magnifications, extended focal imaging and virtual Z-scanning, the host of expanded VS120 capabilities complete the package delivering crisp and precise fluorescence imaging for every need.